Local History and Genealogy Library, a branch of the Brownwood Public Library. Open Tuesday through Friday 9:00 a.m. to 6:00 p.m.
Shop at the Local History and Genealogy Library, or by mail, for CDs. 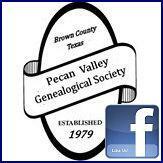 See our inventory at PVGS Store.